In a year when Chaminade bid farewell to its 18-year President Jim Adams, the school also celebrated a national speaking championship, robotics awards, four state athletic championships, another successful college placement year, and a banner year in annual giving. The 2013-2014 Chaminade Fund closed the year having raised $1.2 million – funds that are directly invested in students and faculty. The annual fund raising effort is truly a Chaminade family achievement – 1,325 donors contributed to The Chaminade Fund. Gifts ranged in size from $1 to $75,000. 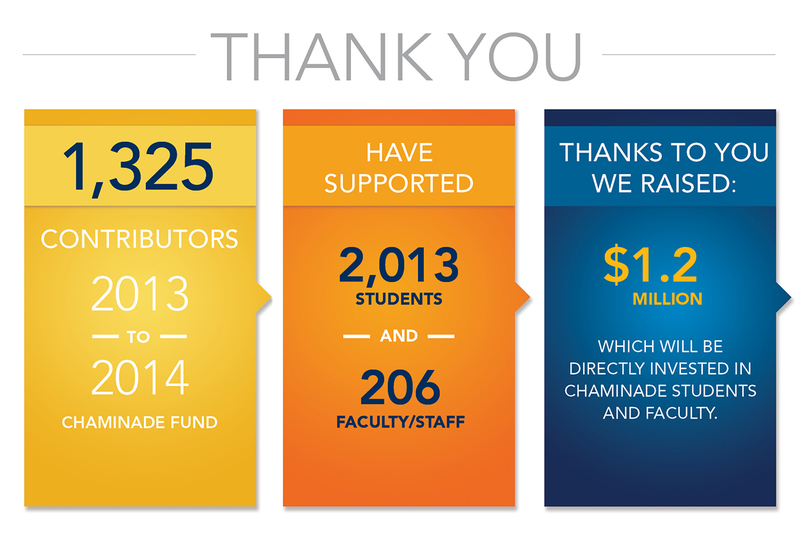 Every single gift, from every single donor makes a difference in the Chaminade experience. Chaminade College Preparatory thanks all of its generous supporters. This entry was posted in Alumni, Faculty and Staff, High School, Middle School, Spirit and Community by Chaminade News. Bookmark the permalink.